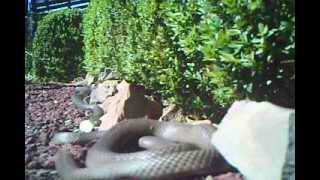 For a geezer at Glen’s neighbourly snake go to his YouTube video. This entry was posted	on Monday, October 22nd, 2012 at 10:35 am	and filed under • The bush, Fauna and tagged with Local, Snake, Wildlife. You can follow any responses to this entry through the RSS 2.0 feed.